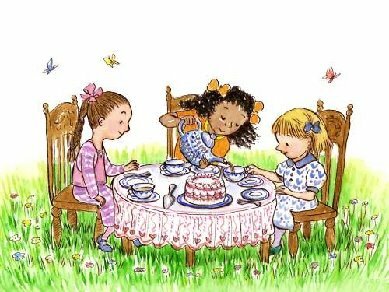 Last Tuesday, as it was the day of food in the 1st graders lesson we had a 5 o'clock tea, an imaginary 5 o'clock tea using pictures of a tea cup, sugar, milk , scones and jam to help the kids to imagine a Tea party. They learnt the basic vocabulary (cup of tea, sugar, milk , scones and jam) and the expressions "Pass me the..., please" "Thank you"
In groups they had to pretend they were having a tea party and they had to ask for the food and drink they wanted, for example "Pass me the tea , please" Thank you. Na passada terça -feira, como era o dia da alimentação, na aula com o 1º ano tivemos um chá das cinco, um chá das cinco imaginário usando apenas imagens de chávenas de chá, açúcar, scones, geleia/doce para ajudar as crianças a imaginar a tea party. Eles aprenderam o vocabulário básico e expressões "Pass me the..., please" "Thank you"
Em grupos fingiram que estavam numa festa de chá e tinham de pedir a comida e bebida que queriam, por exemplo "Pass me the tea , please" Thank you.